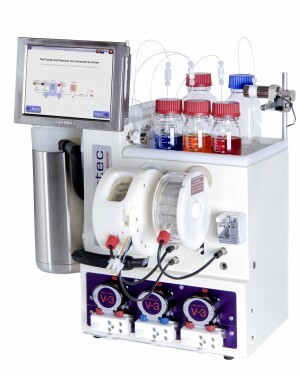 Vapourtec presents application note 57, Automated library synthesis. In drug discovery it is necessary to have access to a broad range of organic compounds for the purpose of testing against models of disease. The testing process employed is high-throughput screening. The name of this, often proprietary set of organic molecules is called a compound library. Some chemicals can be purchased from outside vendors and included into an internal compound library. However, a key driver for a pharmaceutical company is the discovery of novel (patentable) compounds, and so it is important that the compound library contains a proportion of novel compounds. Typically companies employed in drug discovery generate their own novel compounds, library synthesis. New chemical entities are added to a compound library by a process called library synthesis. Chemical libraries are generated for a specific goal. Typically larger chemical libraries are made of several groups of smaller libraries. Automating the process of library synthesis plays an important part in the economics of library synthesis. Proving the potential scope for synthesis of a chemical library can be a time consuming and expensive part of a research program1. Also, as the complexity and cost of reaction inputs to library synthesis continue to grow, such as the use of advanced synthetic intermediates, natural products, peptides etc., economic use of these materials becomes an important factor. 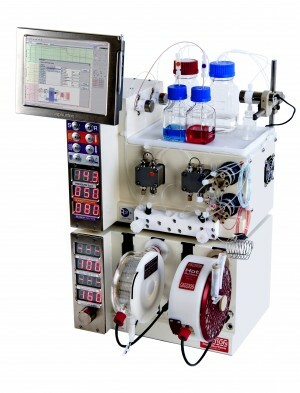 Continuous flow chemistry can be easily automated, creating a platform for automated library synthesis. In application note 57, Vapourtec demonstrate the use of the Vapourtec R-Series in conjunction with the Gilson X241 autosampler, as a versatile and efficient method of addressing these issues. Using examples of SNAr chemistry, we were very quickly able to identify reaction partners for synthesis using a range of nitro-aryl halides and amine nucleophiles. 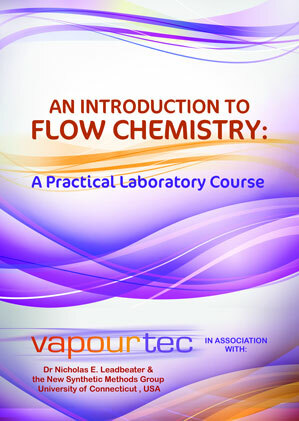 These included ammonia and dimethylamine which, although often challenging to heat in batch due to boiling the volatile amine out of solution, are easily handled at high temperature and pressure within the Vapourtec R-Series. · The use of highly volatile amines and ammonia at 160 °C through the use of high pressures difficult to achieve in batch.